Our one hour General Paddle section, the most mellow area. This area will wind your boat through wild life areas, past ruins of the Old Dance Hall and Rammler golf Course. The sunniest area, is a little slower and more relaxed paddle. Mostly private property on both sides of the river, with limited beaches and resting areas. 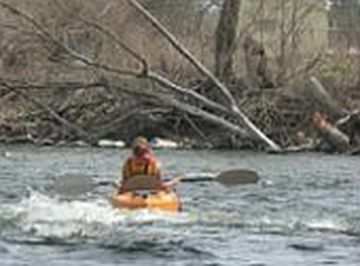 ​For a shuttle up river, you paddle back to the shuttle location (your car). Adventure Paddle Departs at 10:00 AM and 12:00 Noon Only! 5 and 6 hour trips are available. Only by adding Adventure sections to our general 3 Hour section. Group rates available, please call for more information. The mighty section above Yates DAM are water and portage free dependent. Please call for availability. 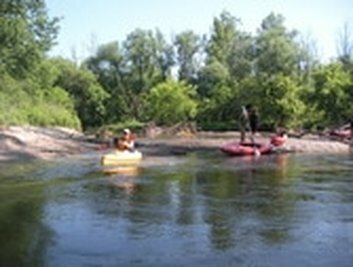 In our Adventure Paddle 2 & 3 Hour sections, 60-70% of boats tip over depending on water level! The first hour of this 3 hour section from Yates to Ryan is fast. Lots of tight turns with obstacles throughout. 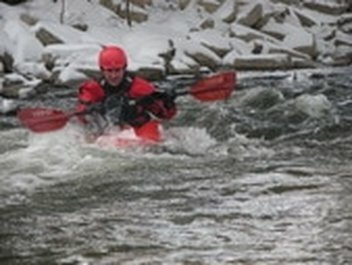 Our 2 hour section from Ryan to Heritage Park you will paddle through Shelby's River Bends Park. The rewards for your work, A Beach around almost every turn, abundant wildlife with a Up-North feel. For a shuttle up river, you paddle back to the shuttle location (your car).